This Wednesday, we will be taking up our Others' Offering. Every year we are privileged to be able to receive this offering and help those in our church family who have a need. 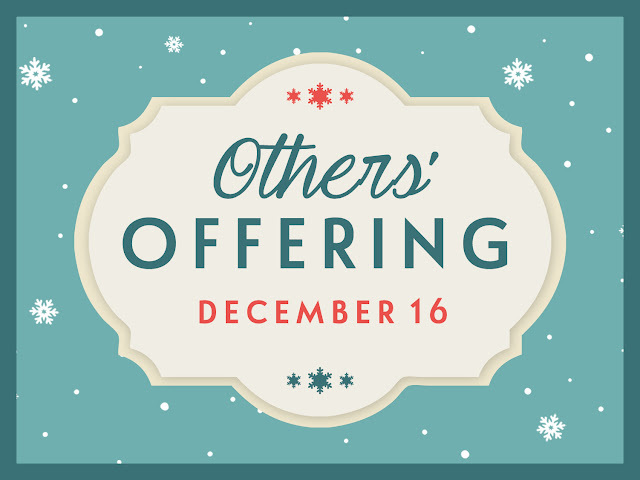 With this offering we are able to help widows, single mothers, and other families in our church who have a need during the Christmas season. We do this for several reasons. Acts 2:44-45 says, "And all that believed were together, and had all things common; And sold their possessions and goods, and parted them to all men, as every man had need." Here we find an infant church and many young believers. As we examine the passage, we find that even though many of these believers were new Christians, they had a special bond with one another. In fact, their bond was so strong that they sold their own possessions and gave to others in need. In James 2, believers are challenged to show their faith through their works! "If a brother or sister be naked, and destitute of daily food, And one of you say unto them, Depart in peace, be ye warmed and filled; notwithstanding ye give them not those things which are needful to the body; what doth it profit? Even so faith, if it hath not works, is dead, being alone." Because we are concerned about one another, we help. In other words, we back up our concerns with our actions. Please pray about what God would have you give to be a blessing to others in our Calvary family. It’s that time of the year again! It seems like 2015 just started and we are already celebrating Christmas! During the month of December, busy roads around shopping centers often feel like parking lots, parking lots like war zones, and checkout lines stretch at least three times their normal length. As we go through this holiday season and talk about love, hope, peace, and joy, it often feels like we are completely missing the point. Have we forgotten that Jesus is the reason for the season? So often, we spend this season making our lists and checking them twice making sure we have gifts for family members, friends, co-workers, and others. Our time is occupied running from store to store making sure to locate that perfect item for the person who already has everything. Christmas isn't about the gifts that we give and receive, but about the Gift that God gave the world. Join us at Calvary on Sunday mornings at 10:30am throughout the month of December as we take time to slow down and focus on the Gift of Christmas, our Lord Jesus Christ! Our children’s Christmas play, “Candy Cane Christmas”, will be Wednesday, December 16th at 7:00pm, and our adult Christmas Musical, “The Gift Of Christmas”, will be on Sunday, December 20th at 10:30am and 6:00pm. Calvary Baptist Church is located at 536 S Main St in King. Feel free to visit our website at cbcking.org, or call us at 336.983.3728.